People who are aging in place or living with a disability can rely on Safe Showers to make bathing easier and safer. Our top-quality bathroom products have features that can help minimize the risk of slipping and falling while entering and exiting the tub or shower. And, unlike many other bathroom remodeling contractors, we’re proud to offer our valued customers in the New Braunfels, Texas, area highly affordable prices. Indeed, it is our mission to help seniors, disabled veterans, and others with mobility limitations live comfortably and independently in their own homes at a price they can afford. Tub-to-shower conversion – We’ll replace your aging tub with a beautiful walk-in shower, featuring three convenient grab bars, a shower chair, and the only truly slip-resistant floor in the industry. Walk-In tub – Our walk-in bathtubs contain the same safety features as our wheelchair-accessible showers, as well as luxurious hydrotherapy jets that can blissfully soothe sore bodies. 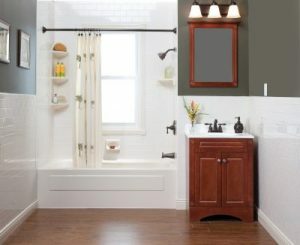 Replacement tub – We install replacement bathtubs with low basins and anti-microbial protection. Safe Showers stands apart from other bathroom remodeling contractors not just due to our industry-leading products, but also our outstanding commitment to customer service. We offer faster turnaround times than our competitors, and we back all of our work with a one-year labor warranty, on top of the lifetime product warranty that is included with our tubs and showers. It’s no wonder why we hold an A+ rating from the Better Business Bureau. To learn more about a tub-to-shower conversion or tub installation for your home in the New Braunfels, TX, area, contact Safe Showers today. Our bathroom remodeling contractors look forward to making your bathing experience safer.